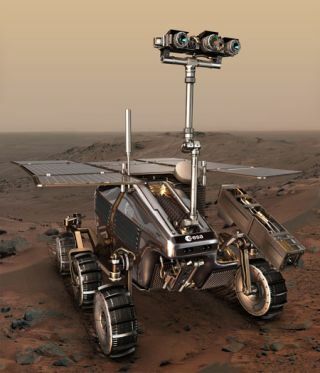 Europe's recently approved ExoMars rover could become part of an international collaboration to robotically return samples back from the red planet and set the stage for human exploration. Multi-robot planetary exploration would be a complex affair,with humans working with a diverse team of mobile robots operating in a varietyof control modes. Aurora Flight Sciences, MIT?s Manned Vehicle Laboratory(MVL), and MIT Humans and Automation Laboratory (HAL) have just won a NASASmall-Business Technology Transfer Research proposal to develop a softwaresystem that performs command and control.
? 'Aurora sees this as an opportunity to expand itsmulti-vehicle coordination capabilities into the realm of planetaryexploration. We view this project as a natural integration of our expertisein space systems and in tools for planning and coordinating autonomous teams,'said Dr. James Paduano, Autonomy Controls and Estimation Group Lead. Mobile robots operating in teams will be instrumental inextending human reach in planetary exploration... However, communication delaysto remoterobot teams and/or the limited supervision that an astronaut can providemake it necessary for the robot team to perform coordinated tasks robustly andautonomously. To address this problem, Aurora and MIT will combine multi-agentplanning algorithms, human interfaces, and associated expertise into amulti-robot, human supervised system that can operate with long time delaysbetween human interactive inputs... "
is supported by recent algorithm and software developments in the military multi-vehicle control regime (including human interfaces). Science fiction writers have long recognized the value ofhaving teams of planetary exploration robots that would cooperate with eachother and work with people in various control modes. He watched the posturings of the robots on the visiplate.They were bronzy gleams of smooth motion against the shadowy crags of theairless asteroid. There was a marching formation now, and in their own dim bodylight, the rough-hewn walls of the mine tunnel swam past noiselessly, checkeredwith misty erratic blobs of shadow. They marched in unison, seven of them, withDave at the head. They wheeled and turned in macabre simultaneity; and meltedthrough changes of formation with the weird ease of chorus dancers in LunarBowl." If you're as interested in team robotics as NASA, don't missreading how the COTSScout: Team Building Robot works well with others, and this story about RoboticSafety Barrels: Smart Traffic Cones. From Aurora Flight Sciences Wins NASA Contract for Multi-RobotPlanetary Exploration. (This Science Fiction in the News story used withpermission of Technovelgy.com).